Dwayne Perreault - As I noted in the first posting I made for this blog, few Swiss wines will ever find a public outside of Switzerland, because they are practically all consumed in their home country. There are two major reasons for this, and they are both economical in nature. Swiss wines are expensive to export, given that land is costly in this tiny mountainous country and production costs are high. Secondly, foreign wines are heavily taxed in Switzerland, which gives local wines an advantage for the Swiss consumer. But the Swiss know a good wine when they drink it, and there is little doubt that Ticino is the country’s rising star. When Hugh Johnson compiled his Wine Companion in 1983, he listed no more than five producers. But there has been a renaissance happening here in the last 20 years, and the region is now producing some outstanding Merlots, some of which can rival St. Emilion and Pomerol, both in quality and price. One of the winemakers Johnson mentioned in his guide is Werner Stucky in Rivera, a small producer working 4 ha of land, who studied both in Switzerland and in Bordeaux under the famous oenologue Emile Peynaud. Stucky is an unpretentious man who makes only three wines, all of them seriously good vinos da tavola. When I asked him why he doesn’t produce wines which fall under the DOC classification, he simply replied that that doesn’t interest him. His customers, all restaurants and private individuals, know that a Stucky wine stands for quality. Stucky might indeed be called a garagiste: his wines are made in the garage, where every square centimeter is put to good use. After a short tour of the premises, we retired to his house to get to the business at hand, the tasting. First up was a truly unique white wine, Temenos, made from Sauvignon Blanc and Completer, a rare Vinifera sort originally brought by the Romans from Lazio some 2,000 years ago. It is eschewed by most producers, largely because it is extremely oxidative, but here it is used to give the wine acidity, as Sauvignon Blanc tends to be more fruity than dry in this sub-tropical climate. Golden in the glass, it has a bouquet which is rather difficult to describe, but is rather like sticking your nose into a deep well, earthy and fresh at the same time. Aged 10 months in oak barriques on lees, its taste was dry with some minerality, but also quite complex with wood tones and a nutty flavour due to the lees contact and the oxidative Completer. Stucky produces only 2,000 bottles of this wine per year, admittedly to suit his own palate, though I must agree, this is a wonderfully complex white which would accompany a wide variety of fish dishes. I feel privileged to have tasted the last bottle of the 2007 together with him. Next up was the Merlot, Tracce di Sassi 2007, made from old vines on gneiss soils which provide excellent drainage. This lustrous ruby red wine had both cherry and blackberry in the bouquet, with abundant leather and tobacco. The taste was concentrated dark fruit, full bodied with a hint of licorice. This is not Merlot in a simple style: it aims to please, and wants to be enjoyed with a good piece of red meat or a hard, aged cheese. Aged 12 months in barrique, it is sensual and enticing. We finished with Conte di Luna 2007, Stucky’s most popular wine, although only 3,000 bottles are produced yearly. This is a Cabernet Sauvignon/Merlot blend which sees 16 months ageing in new oak, with a dark garnet colour and very dark fruit in the nose. A powerful wine with strong tannins, my feeling is that it could use some bottle ageing, although Stucky professes not to be a lover of old wines, preferring pure fruit expression. If you are visiting Lugano or Locarno, and like to drink quality wine that is artisanal in nature and eschews everything that is commercial, I strongly recommend you visit Werner Stucky, where you may purchase his wines by the bottle or case. 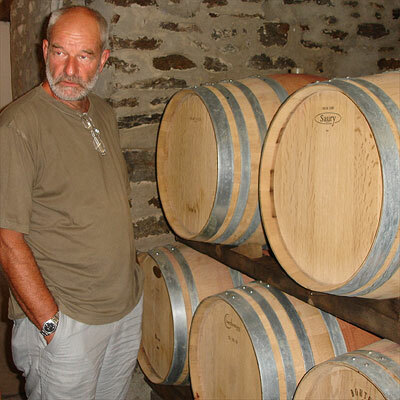 This warm-hearted and friendly man will change your conception of Swiss wines forever.